The day of the crucifixion of Jesus was an incredible day in history. Early in the morning Jesus was transferred from Caiaphas, the Jewish High Priest, to Pontius Pilate, the Roman military governor. When Pilate learned that Jesus was from Galilee, he sent Him to Herod Antipas. Herod quickly sent Him back to Pilate. Under pressure from the religious leaders, Pilate delivered Jesus to be crucified. The numerous events from the last day prior to the crucifixion of Jesus are recorded in the New Testament (Matthew 26-27; Mark 14-15; Luke 22-23; John 18-19). As early as Byzantine times Christians began to follow the final steps of Jesus on specified days. Over the centuries many changes were made in the route and the stops. The traditional Via Dolorosa, as known today, was fixed in the 18th century. According to tradition, the fifth station of the cross is where Simon of Cyrene (modern Libya) was compelled to bear the cross of Jesus. Some of the stations of the cross are not mentioned in the New Testament, but this one is. 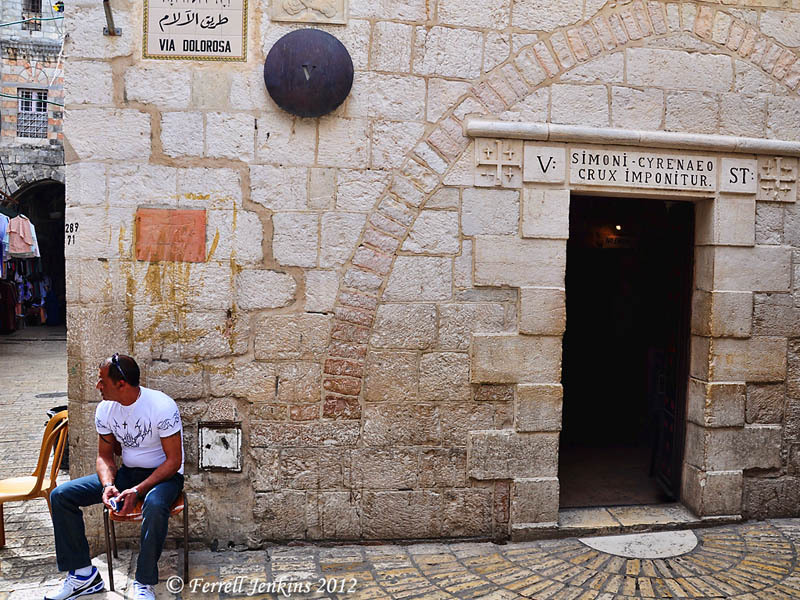 The Via Dolorosa in Jerusalem. Station V. Simon of Cyrene is compelled to carry the cross of Jesus to Golgotha. Photo by Ferrell Jenkins. Great experience that day it will really helpful for other tourist thanks to share with us. Thanks for sharing your experience with other readers. I walked the Via Dolorosa today. So many people were there wanting to experience Good Friday in the place Jesus was.